Adding a “✋ Stop” to a task in a template will turn it into a stop task. 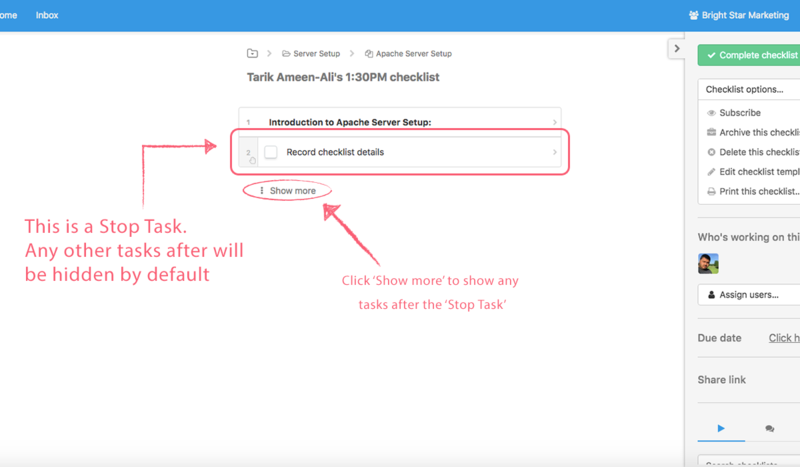 All tasks after the first stop task, and the checklist itself, are disabled and can not be completed until the preceding stop task(s) are complete. Put another way: stop tasks stop a checklist at that point. Nothing past that point can be completed until the stop task is done. 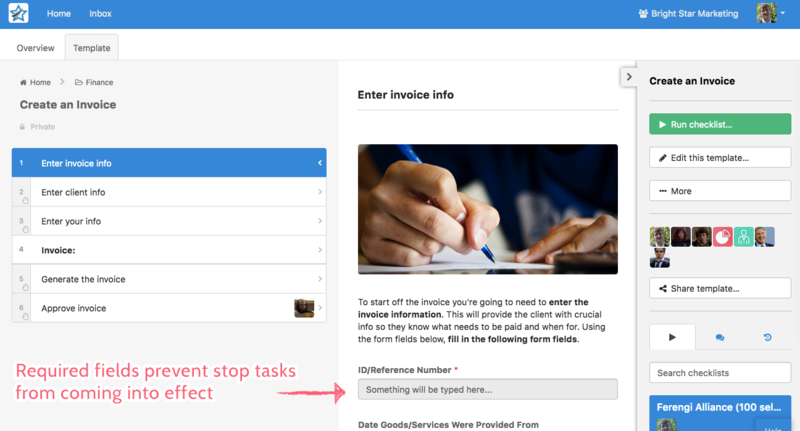 This simple little action turns basic checklists into powerful workflows. Note: Stop tasks are a business pro feature only. 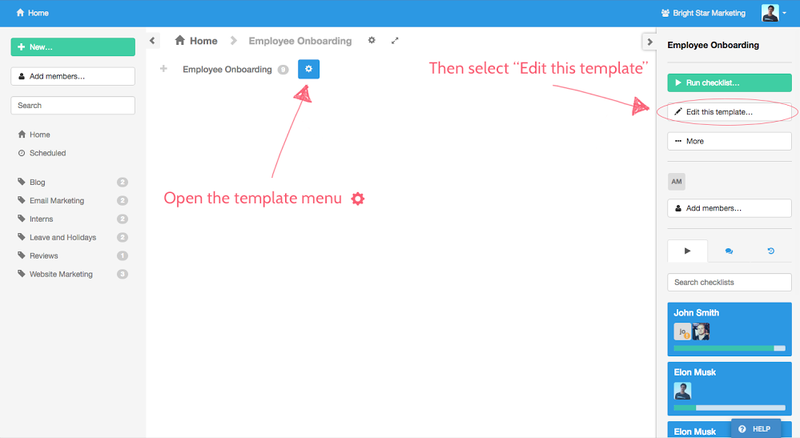 Adding stop tasks to your template is easy. Just hit the “Add Stop” button on any task. Stop tasks are indicated with a ✋-style icon just underneath the task number. If you are wanting to enforce the order on a number of tasks in one go, you can use a keyboard shortcut to select a number of tasks at once. To select many tasks in one go, hold down the ‘Shift’ key (Windows & MacOS) and use your mouse to click the two tasks and everything in between will become highlighted. You can then click the ‘Add Stop’ button and save your template. You can also use the ‘CTRL’ Key (CMD in MacOS) to individually select multiple tasks at a time. Hold down the ‘CTRL’ key (CMD in MacOS) and use your mouse to click all the tasks you want to add a ‘Stop’ to. You can then click the ‘Add Stop’ button and save your template. Once you run a checklist with a stop task, the tasks after the stop task will be disabled and hidden by default. A disabled task cannot be completed until the previous stop task is checked off. You can click on ‘Show More’ to expand the view to any tasks after the ‘Stop Task’. Once the preceding stop task is complete, the task is enabled and can be completed. Disabled tasks do not trigger assignment notifications and do not appear in Inbox until they’re enabled. This is great for reducing clutter in members’ inboxes, and noise from email notifications on tasks that may not be ready to complete. If your checklist contains tasks with required fields before the stop task, the stop task will be disabled until all required fields have been completed. This is great for ensuring certain information is submitted before a checklist can continue.